Early in my fish keeping years, I came across a little yellow fish with black polka dots. It had a cute baby face and greeted me at the glass, like a puppy dog, appearing happy to see me. I had to have him. I took the little cutie home and everything seemed fine as I went to bed. I awoke to find the rest of the fish cowering in one half of my aquarium, missing fins and tails. The little "sweetheart" was happily buzzing around the other side of the tank, belly full of fins. I realized this was definitely not a fish for my community tank and sadly returned him. Since then, I have set up a separate aquarium for my favorite puffer; the green spotted puffer, or GSP (Tetraodon nigroviridis). I now have 2 beautiful fat 6" adults, Cricket and Bozo. They live in a 55g tank. I decided to write an article about them, to prevent many more of these fellows from having to be returned, or even flushed, because of misinformation given at the stores they are purchased. GSPs are probably the most commonly available puffers in the aquarium market today. Mostly sold as freshwater fish, they are really a brackish water species. Born in FW, they migrate through the estuaries (streams) between FW lakes and the ocean, to live out their adult lives in saltwater. Although you may hear these fish do fine in FW, they will grow larger, have brighter coloration, suffer less disease and live longer in higher salinities. It is our duty as fish keepers to keep our friends in the best possible conditions for their health and happiness. Puffers must be introduced into a fully cycled tank. Please do not cycle your tank with puffers in it, or any other fish for that matter. Fishless cycling is quick and doesn't do harm to a living thing. You can also "instant cycle" with Bio-Spira. You need to add your fish immediately after adding these live bacteria to your tank. Aragonite or crushed coral substrates are used to help maintain a stable alkaline pH of around 8. I suggest keeping GSPs at low-end BW when juvenile <2", (in a specific gravity, or SG of 1.005-08), at 2-4", medium BW (SG 1.010-15) and adult >4" SW (SG 1.018-22). You must use marine salt. You will need a hydrometer to measure the salinity. It takes a cup of salt/5 gal of water to raise the SG .005. If the puffer you purchase is in FW at the store, then you should start out your tank in FW and raise the SG .002/week, until you reach the desired SG. This is so you don't destroy the good nitrifying bacteria as you add salt. SW bacteria are different than FW, so you need time for the SW bacteria to develop as the FW bacteria dies off slowly. If the store keeps their puffers in BW (congratulations, you've found a store that really cares about their fish), cycle your tank at whatever SG the puffers are living in at the store. If you already have an established BW tank and are buying a puffer kept in FW at the store, you need to acclimate it very slowly. Whenever I change a fish over from FW-BW, BW-SW, or visa-versa, I use a drip system. I put the fish in a bucket below the tank I will be moving it into, covered by water from the tank the puffers were living in, about 1" over its head. I tie a knot in an air hose until it drips enough water into the bucket to raise or lower the SG in the bucket .001/hour. Puffers are messy eaters and high waste producers. Extra filtration is necessary for these dirty fish. Immaculate aquarium upkeep is a must. Algae growth also needs to be removed by the fish keeper. There are no BW algae eaters that can live with a GSP. (Sorry, you'll have to do your own maid service!) Because of their aggressiveness towards tank mates and the high amount of salt they prefer, there are not many fish that can live with them as companions in general, or for clean up. Only after my puffers were raised to SW, was I able to "trick" them into letting me keep hermit crabs with them by scattering many empty shells around the substrate. They just can't tell the hermit crabs are there. Perfect water parameters are necessary for puffers. This means 0 ammonia, 0 nitrItes and nitrAtes below 20. I do 50% weekly water changes on all my tanks, vacuuming under dÃ©cor and getting into plants to remove all uneaten food as I go. Puffers are scale less fish and are without gill covers. Therefore, these fish are very sensitive to most meds and this is why keeping perfect water conditions are so important for them. The best way to keep them healthy is not to let them get sick. Water changes, water changes, water changes! When choosing your long-lived pet (10+ years), try to find one with a round belly that comes to greet you at the glass. You can start a young one out in a 10-15g tank, but once it is >2" they need a 20-30g tank/fish. Keep in mind, in tanks this small, puffers will not be tolerable of tank mates. Puffers are wild-caught fish and many come in with internal parasites. If your puffer eats, but still looks thin, or has stringy-looking feces, it could be carrying internal parasites. I prefer the product Discomed, by Aquatronics, for the treatment of internal parasites. You must soak their food in it and treat for 7 days. Puffers get pretty beat up during shipping and over crowding. Most have nipped fins when received; some are even missing fins. Getting them into BW as soon as possible is one way to help with that. I also like to add Melafix to the water to help with re-growth. I quarantine all new fish so I don't have to treat the whole tank and to prevent spreading possible diseases. One of the most difficult aspects of keeping these special fish is their diet. All puffers are predatory fish and need hard-shelled, meaty foods to keep their teeth trimmed. Like rabbits, their teeth grow constantly and can overgrow enough to cause starvation in the fish. Puffers eat crustaceans in the wild. Foods for smaller puffers are frozen/freeze-dried krill/plankton, gut-loaded ghost shrimp, glass worms, crickets, worms and small snails (the size of their eye). Snails are an essential food to a puffer's diet, especially when small. Many serious puffer keepers breed their own snails. As your puffer gets larger, there are many more crunchy foods for them to eat. Larger GSPs will eat cut-up pieces of scallops, shrimp, crab legs, whole mussels, clams, oysters, squid, lobster and crayfish. Mine love to chase live crayfish, fiddler crabs and gut-loaded ghost shrimp. I gut-load (pre-feed) my live food with algae wafers, so my puffers get their veggies. I buy most of these foods at the fish department of my grocery store, freeze and later thaw in warm vitamin water as needed. Smaller puffers (under 2") need to eat every day, skipping one feeding/week. Feed them until their bellies are slightly rounded. Medium sized puffers (2-4") should be fed every other day. Larger puffers (4-6) should be fed every 3-4 days. You may find this schedule difficult, as puffers are very adept at begging for food! Feeding puffers every time they beg will cause fat, lazy fish and eventually you will be killing them with kindness. These little alien-looking creatures are highly intelligent (for a fish), personable and entertaining. I have had luck with them tolerating some tough, fast-moving tank mates, only to find them missing after several months or even years. Younger puffers may seem more docile, but all will nip the fins of slower-moving or long-finned fish. I have been very successful keeping my GSPs with their own kind and also with the Ceylon puffer (T fluviatilis), as long as they are all the same size. I wouldn't suggest any other puffers with them. Some folks have mentioned some success in keeping GSPs with figure 8 puffers (T biocellatus), but I believe it is only because the GSPs are still young. F8s are only mildly aggressive and grow to half the size of a GSP. Adult GSPs are extremely aggressive predators and the majority of them have a nasty disposition. They are vicious fin-nippers and known killers. Therefore, choose their tank mates carefully or be prepared to loose a favored fish. GSPs need a heavily decorated tank with plenty of swimming room, lots of hiding places and various broken lines of sight. If your puffer is constantly swimming up and down the glass, he is bored and needs more dÃ©cor to swim around and investigate. Some folks occasionally move dÃ©cor around for added interest to this clever little fish's life. Always have a secure lid on your puffer tank and check often that it is closed. They are known jumpers! Do not try to make your puffer puff! Puffing is a defense mechanism brought on by fear and stress. It is not good for your puffer to inflate itself. Never take your puffer out of the water! It can puff with air and may never recover. I have had some success in "burping" a puffer, by holding it vertically, head up, under water and gently shaking it by it's tail until the air is released. A puffer with air inside cannot right itself and will die. If you ever need to catch your puffer (even when getting it from your LFS), scoop it up with a container. There is huge confusion about spotted puffers in many books and on the net. Some even say there are 3 kinds of spotted puffers. GSPs have many common labels given to them at the LFS (local fish store); leopard spotted puffer, leopard puffer, green puffer, green spotted puffer, or spotted puffer. 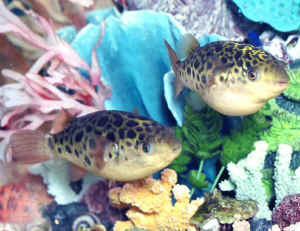 There are only 2 "spotted puffers". Rarely seen is the Congo spotted puffer (T schoutedeni). This is strictly a FW puffer. The only visible difference between the Congo spotted and GSP are the longer spines on the Congo's belly. (All puffers have some spines). It is highly doubtful that you have a Congo spotted puffer in your tank. They are almost never found in the aquarium trade and would be very expensive to purchase. Some misinformation read is that there are two kinds of green spotted puffers, the green spotted (T nigroviridis) and green puffer (mislabeled--T fluviatilis). One GSP may be longer than another, rounder, eyes set back further, or nose stubbier, but these fish are all one in the same. The T fluviatilis (commonly called green, topaz, or Ceylon puffers) looks like a cross between a Figure 8 puffer (T biocellatus) and GSP (T nigroviridis). Their backs have the yellow markings of a F8 and the sides of the fish are spotted like the GSP. If you have a puffer that you thought was a F8 but has grown much larger than 2 Â½-3", it is probably a Ceylon puffer.